Imagine an outdoor shed that you did not have to paint or maintain every year and that is stain resistant and easy to clean, a shed made of materials lighter and more durable than wood that would not crack, chip or peel, with built-in UV inhibitors made to resist heat. This shed has double walled technology to prevent sagging or soft spots and solid steel bands placed in the wall panels for a sturdy foundation that adds strength and stability. Extensions can also be purchased later on to fit your growing needs for storage, and it comes with a high pitched roof with steel trusses that provides ample head room and that is also steep enough to allow for quick drainage of rain and snow. 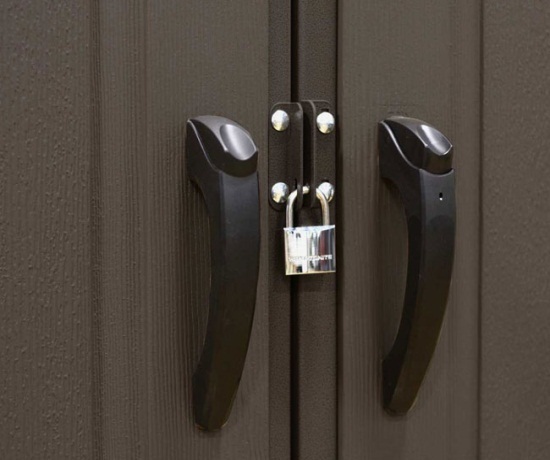 You will find these features in the 60001 Lifetime Garden Shed. 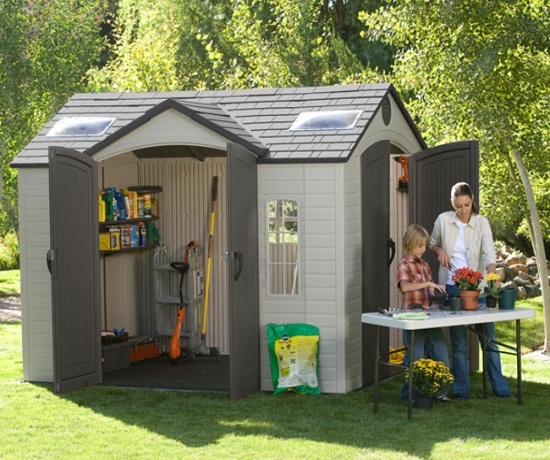 This shed also sports two entries for added convenience to access your yard equipment or anything else you are storing. 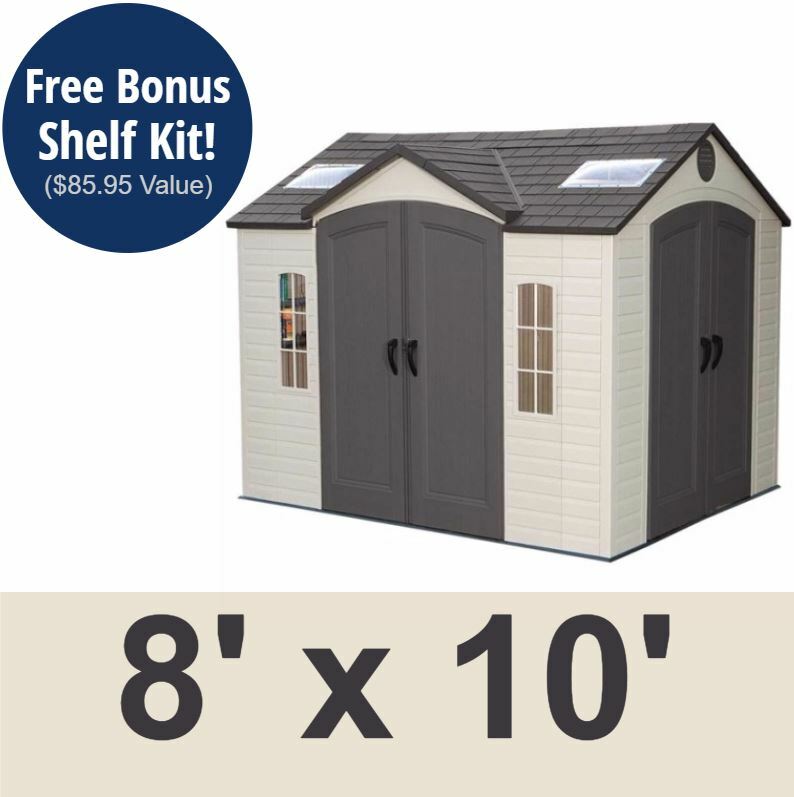 This shed comes with a 10-year factory warranty from Lifetime Products for customers in the United States and Canada. 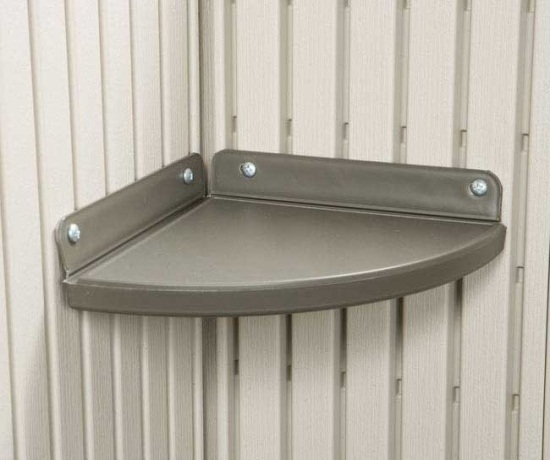 Polyethylene plastic requires little to no maintenance. No repainting required. Polyethylene resists fading, cracking, and peeling due to sun exposure. 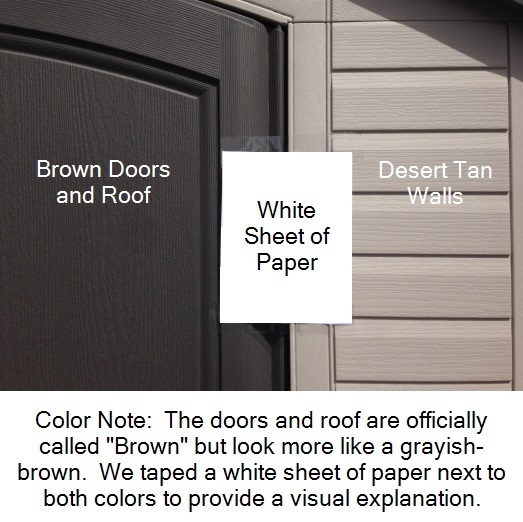 Wall color: color comparison varies by person, but most describe the color as beige, off-white, desert tan, or sand. 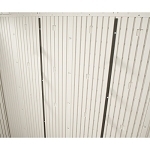 Walls are steel reinforced to provide added rigidity and durability. Walls are assembled using a paneling-system design. This design means every 2.5 ft, with the exception of the end caps, is a new panel. Panels interlock and then fasten together. 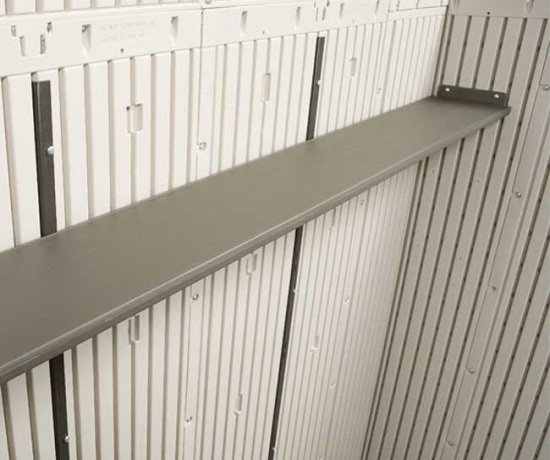 Steel reinforcement are powder coated to help resist rusting. Comes with two shatter proof windows for panels near the door on the 10-foot side; and 1 additional window on the back side. Window on the back of shed can open for ventilation. Walls are capable of supporting up to 50 lbs. on the shelving. Wall height from the ground to the lowest roof line: about 72 inches. Roof dimensions: 120 inches L (from side to side of the shed) x 96 inches W (from front to back of the shed). 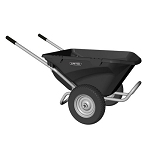 Material of construction: steel-reinforced polyethylene plastic. Steel trusses in the roof are powder coated to help resist rusting. 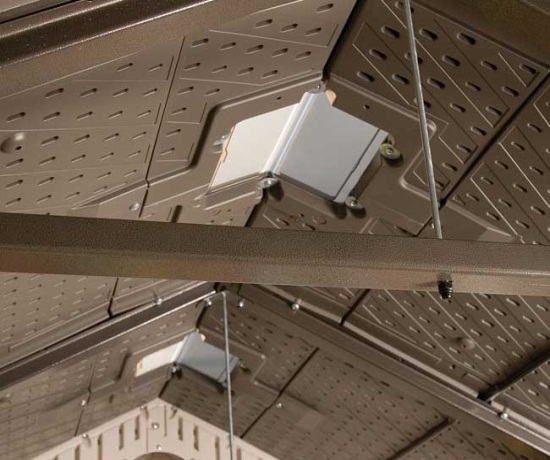 Steel trusses have channels along the roof panel seams that directs any water seepage out of the shed, keeping contents inside dry. Roof constructed using a paneling system; every 2.5 feet is a new panel (except the ends of the shed, which have a small roof section to start off). Panels interlock and fasten together. Roof has 6 skylights; 2 Large skylights and 4 small skylights. This storage garden shed building comes with a floor. Floor material of construction: 1 inch thick polyethylene plastic. Floor has slip resistant texture. Floor is easily cleaned and stain resistant. Side doors can be placed on either side. This shed has two entry ways with double doors. Doorway entrance height: 76 inches L x 56 inches W.
Doors have internal spring latches, interior dead bolts, and exterior padlock loops. Doorways are steel reinforced for improved rigidity. Nominal Dimensions: 10 ft. x 8 ft. This shed comes with a 10 year warranty from Lifetime Products. 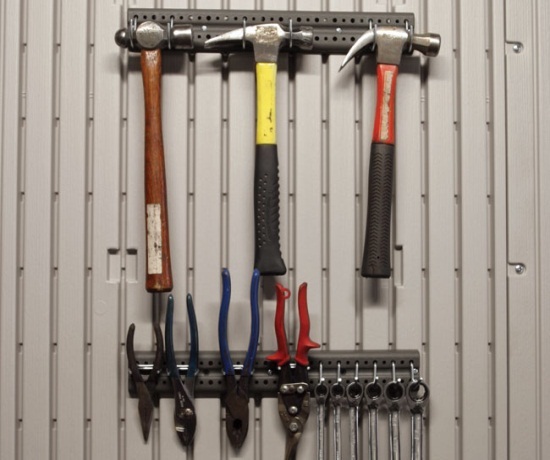 Comes with Peg boards - Two 16 inch Super-strong peg hook strips and 20 tool hooks. 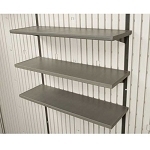 Built-in shelving: 1- 90 inch x 9 inch shelf, and 4 corner radius shelves. 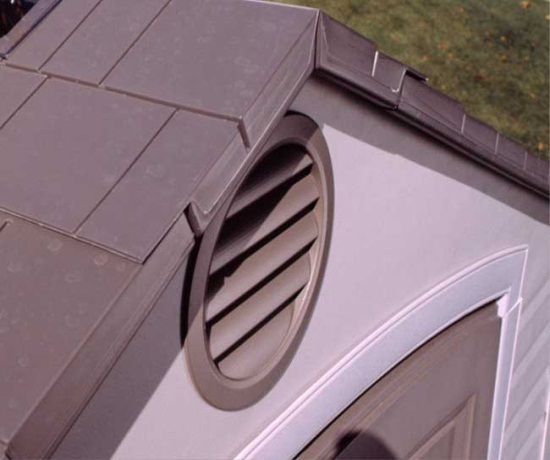 2 screened vents provide airflow and ventilation for your Lifetime shed. Quick transaction. Good Price. Will do business again!!! I enjoyed shopping on this web site. I found products easy to find and good descriptions. For the 8x10 Brighton shed with two doors. Directions are detailed. YouTube videos are great. Pictures in the instructions are very clear. There are 3 sets of instructions in the box - one set is in English. Allow yourselves lots of time - its doubtful you can assemble this in the time they say unless your crew is experienced building these sheds. The wall corner panels are labeled as if the front of the shed is the 8 side with the door - and this is how it will go together. The written directions for wall assembly refer to the front of the shed being the 10 side with the door I am told. If you are assembling in the heat of summer (90-95+ degrees) assemble what you can inside in air conditioned comfort (sections of the roof truss, door handles, bubble skylights - Butyl tape is easier to work with if you put it in the freezer for awhile first. ) Make sure every part left laying in the sun is laying flat on the ground or it warps which makes the screw holes harder to line up. This crew found that in the heat, using the wood piece under the floor slot when assembling walls, did not work as well as leaving the floor flat and angling the wall panels slightly outward so one side of the panel-tab would pop in easier and then rocking the panel inward and hanging on it to pop the other side in worked for everything but the corner. The second half of each corner took a very big guy to power that in. We replaced the cotter pins in the kit with bigger ones that did not slip through the hole in door-assembly rod. If you do not have larger cotter pins handy, bend the head on the ones you have. Short reviews are worthless so I hope this one helps someone. This unit is great. Lifetime has added some improvements with this unit since I purchase a similar one last winter. Good work guys. Took me some time to decide whether to get this or a Keter Factor. Good thing I followed my best judgment because getting this absolutely did not disappointment our decision. Got one of this from Lowes this early winter. During assembly I asked for very minimum help, just to hold both doors upright then finished the rest myself. I had no problem following the instruction since it was clear and straightforward. I did stumble some missing items but Lifetime customer service address my issue without delays. Hats off to them, being so professional. Shed survived its 1st Alberta winter therefore I think this structure will last until it drop. Wonderful design too, currently an envy to view in our backyard. Good job Lifetime! 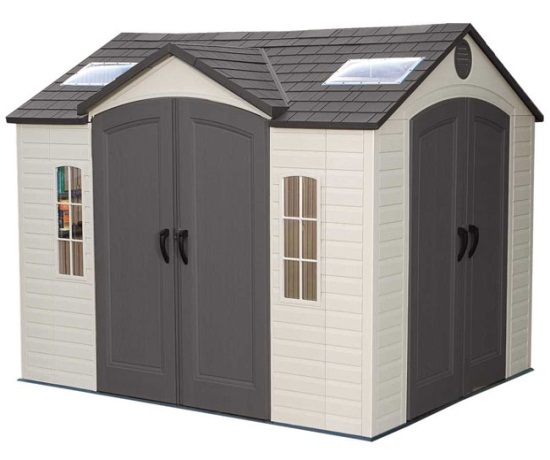 Q: Is the 8 x 12.5 option also a dual entry shed? I cannot find this option on the lifetime website. 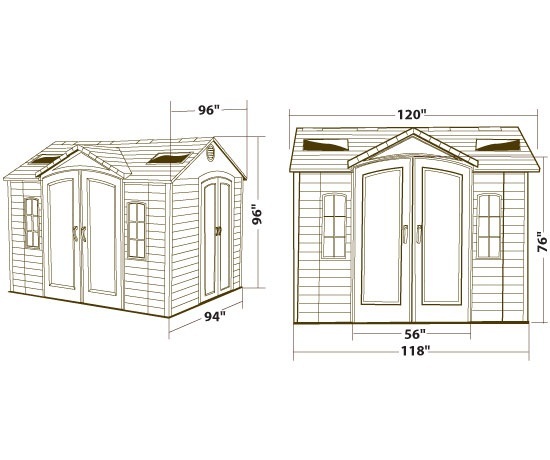 A: Yes, the 12.5 foot option is also a dual entry shed with the door on the short side in the door on the long side. Just keep in mind that the door cannot be centered when the shed is 12.5 feet. In other words you will have 30 inches more on the right side or the left side (your choice during assembly) of the doors. Feel free to contact us with any other questions. Q: What is the storage shed made out of? If we want it installed do you have people you recommend? Q: What size is the side door the width of the door? A: Both doors are 57" wide in opening. Feel free to contact us with any other questions. A: It is 57 inches wide. Q: How much in Canadian money? Do you ship free to Newfoundland Canada? A: This is listed in US Dollars, Shipping to Canada is not free, but can be calculated on the checkout page. Canadian locations may have additional taxes or fees. Due to high shipping charges, most customers prefer to send these larger items to a location near the border on the U.S side, and then pick it up from there. Currently we only allow pickups in Clearfield Utah. Q: We live in Maine and are wonder what is the load (roof) weight capacity? A: The max roof load is 23 pounds per square foot. Q: Can u get this shed in any different colors. Such as gray with white trim? A: Unfortunately this is the only color currently available. You could check with your local paint store to see if they have any recommendations. Q: What are the dimensions of the door opening? A: The door openings are 56” wide by 76” tall. Q: can the side doors be installed on the other side of the shed? A: Yes, they are interchangeable. You can install them on the left or the right side-your choice. Feel free to contact us with any other questions. Q: How do you anchor the lifetime 60001 shed? I don't see any anchors to buy on the Lifetime site. Thanks. A: These sheds do not include anchors because they are unnecessary under most circumstances. They do have holes for anchors if you want to buy anchors for it. Q: Do you have a list of installer for this shed? A: For an installation quote please call 855-544-8854. Q: Can I get the hardware kit for this shed and instructions, someone was getting a new shed and sold us shed but didn't have nuts and bolts? A: You can obtain that at 800-225-3865. Q: What is the cost for delivery? A: Shipping is free within the 48 United States. Q: How wide are the windows? 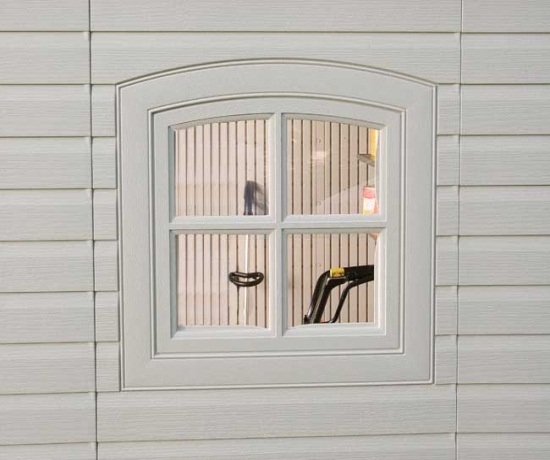 A: The windows on the front are about 10 inches wide and the extra window on the back is about 24 inches wide. Q: Is there a shed like this with door and windows on the 8 ft side with just a man door? 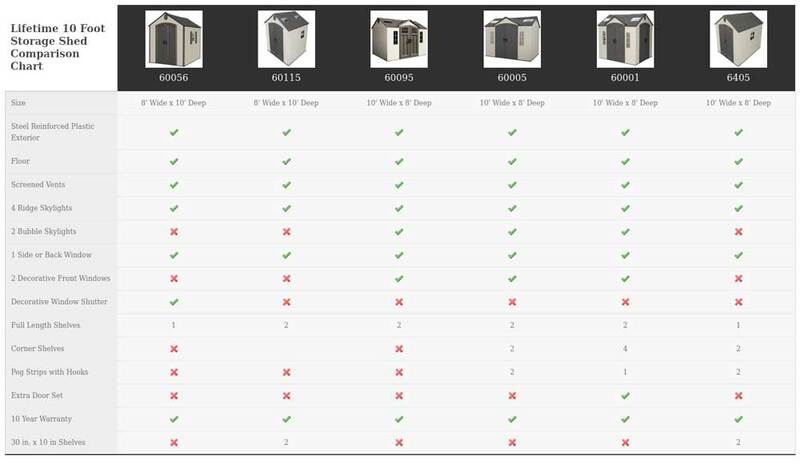 A: All of the doors are double doors, but the closest model would be 6405-if you type that number into our search box and give you more information. Q: How wide and long do I need to make the base if I'm doing a wooden base option? What about concrete? A: If you are doing a concrete slab you will want to make the dimensions of the slab 118 1/4 inches long/deep x 93 1/2 inches wide. If you are building a wooden base you will want to build the platform to be 118 1/4 inches long/deep x 93 1/2 inches wide (the same dimensions as concrete). Shipping: Orders for the Lifetime Dual Entry Storage Shed generally leave the warehouse the next business day. Dimensions: 96" x 32" x 34"